I could not make this up even if i tried. Come to think of it when ppl go jail them either find man or god good thing it was the latter for Bounty. 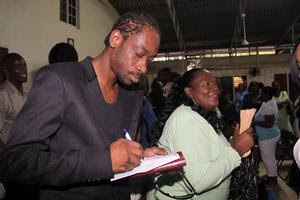 Dancehall artiste Rodney 'Bounty Killer' Price may think that it was divine intervention why he was granted bail on Friday, and so, attended church yesterday to give thanks. Bounty Killer was arrested almost two weeks ago on a warrant by officers from the Constant Spring Police Station. The court heard that on March 30 the female complainant told police that the deejay had assaulted her. It was further revealed that the complainant had reported that she had been involved with the deejay for three years, and when she told him that she wanted to end the relationship and move on with her life, he got angry and hit her all over her body. Bounty Killer, who was initially denied bail and then had his case put off, spent almost two weeks behind bars, and was only released on Friday. 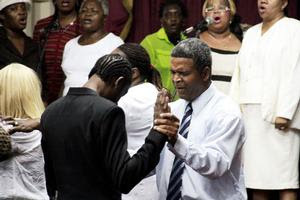 Now a free man, he says: "It feels good to be here in church, as it was God who allowed me to be bail, after spending almost two weeks, and the church came and pray fi mi before mi go court the last time. 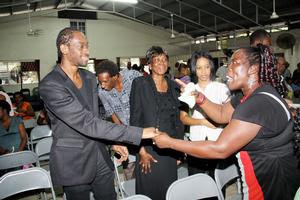 It really good man, to be in church," Price told THE STAR at the Agape Christian Fellowship church in Gregory Park. The entertainer, who was offered bail on Friday for assaulting his girlfriend, was dressed in his customary black. He participated in the altar call, clapped and worshipped with his mother at his side, while the church sang, "Jesus how I love calling your name." It was a penitent-looking Bounty that came and worshipped. "A church mi sey now yu hear, as God alone can do it. Yes, a straight church mi a sey," Price said. 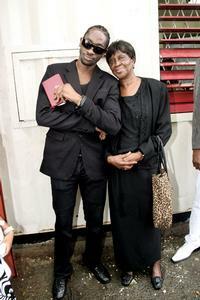 His mother, Ivy Williams, affectionately called 'Mama Ivy', said her son is one who loves God dearly. "I am a member of the church and I know that Rodney loves God very much and he has reason to," Williams said. We always hear, him even laugh with me and told me to do my school work." After signing a number of autographs and giving words of encouragement, Price and his entourage left the church as blessed souls.